I arrived in Amalfi around 1:40pm, so just in time for lunch, Spanish time! 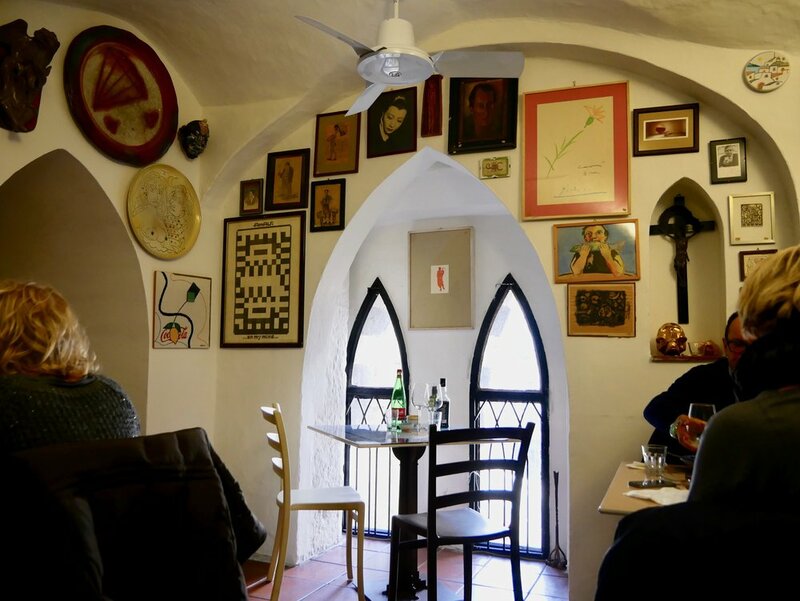 Through reading some reviews online, I thought the Taverna degli Apostoli sounded like a promising choice. ...and you get to the front door. Up another flight of stairs inside, and you arrive in a cozy space decorated with lots of artwork. I read that the space was previously an art gallery, and they maintained the same artwork. The service was very professional, with the waitress speaking intelligently about the menu. For a starter, I ordered the "Slow cooked Octopus in olive oil, garlic and Mediterranean herbs." It's served in this jar, in which it was apparently cooked at low temperature for three hours. 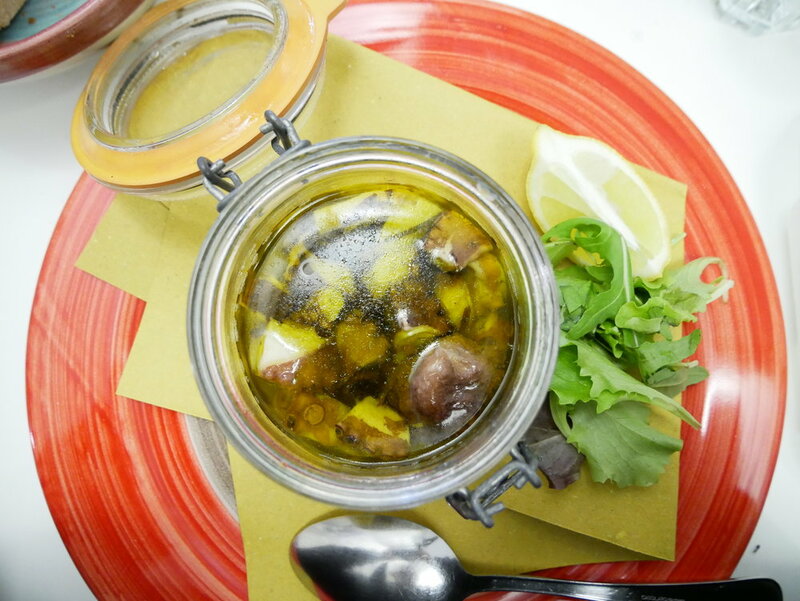 Submerged in the oil were the most tender chunks of octopus infused with the most amazing flavor of aromatic herbs. I dug through to find: rosemary, thyme, sage, peppercorns, and whole garlic cloves. I was so sad when I finished my jar! I will definitely see if I can recreate this dish at home! For my next course, I was contemplating ordering their signature dish, "Home made spaghetti with 'lemon pesto,'" as I thought it would be fun to try a dish with the region's famous lemons, and I like all kinds of pesto. But I had such good memories of my seafood pasta from last night, that I went for the "Vermicelli from Gragnano with local clams in a light parsley and olive oil sauce." This was actually one of the waitress's recommendations, too. Unfortunately, the "vermicelli from Gragnano," a place close to Amalfi, was quite thick, and in my opinion, could have used just a few more seconds of cooking. The noodles were quite hard, and didn't soak up much of the sauce. The whole dish became rather bland. Still, that amazing, revelatory octopus dish overweighed the disappointing pasta (and the great service and bustling ambiance helped too). This wasn't a cheap lunch, but it's one I'll remember for a long time. Let's hope I have some luck recreating that octopus dish!